This week’s Song of the Week, Twilight in Turkey, comes in the context of the work I’ve been doing over the past month or so in putting together a programme of songs, stories, film, and ephemera for ‘The New Orientalism’ Learning Pack that Radio Days will soon be offering. I don’t now remember when I first came across the music of Raymond Scott (1908-1994), though I’m guessing it must have been at the close of the 1960s or in the early years of the 1970s. And it was through his work as a pioneer of electronic music (and inventor of electronic instruments) rather than as a jazz composer and musician that I first heard his recordings. So far as I remember, I’d been introduced to electronic music by my schoolfriend Terry Banyard who in around 1968 or 1969 had played me Pierre Henry’s 1962 masterpiece Le Voyage. On the same vinyl album, presumably the ‘B’-side, was his Variations pour une porte et un soupir. So fascinated and excited was I by this new form of musical expression that I was eager to discover further exponents. For the obvious reason of their (relative) commercial success at around that time, Karlheinz Stockhausen (Aus den sieben Tagen, 1968) and Walter (Wendy) Carlos (Switched-On Bach, 1968) were to be my earliest discoveries, as I remember it, but Raymond Scott was not far behind. Born Harry Warnow in Brooklyn to Russian Jewish immigrants, both Rayond and his brother found their careers in music. 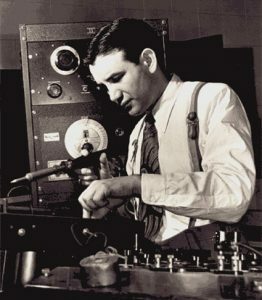 A 1931 graduate of the Juilliard School of Music, where he studied piano, theory and composition, Scott began his professional career as a pianist for the CBS Radio house band conducted by his elder brother, Mark Warnow, changing his name to ‘Raymond Scott’ to avoid accusations of nepotism. Scott was always slightly maverick, the Frank Zappa of his era as he has since been called. In 1936 he assembled his first band, the Raymond Scott Quintette. Not only was this an unconventional way of spelling ‘Quintet(te)’ but in actuality it was not a quintet at all but a 6-piece. He apparently told a journalist, when questioned on this, that “calling it a ‘sextet’ might get your mind off music”. In the years 1937 to 1939 the band enjoyed a number of hits with Scott’s intriguing compositions, many of which he would later reprise with electronic versions. So, for your pleasure today: the Raymond Scott Quintette’s Twilight in Turkey (1937), with its delightful eccentric film set and dancers, juxtaposed with his later–and surprisingly modern-sounding–electronic version of the same song. Finally, a special for Radio Days reader Peter Norris: the Raymond Scott Quintette’s War Dance For Wooden Indians with its fabulously eccentric tap-dancing Indians chiefs. They are, Peter. oddly reminiscent of early Keppel Wilson and Betty. You saw this post very quickly! and I’d subsequently re-edited it to include other songs. I’ve tagged ‘Wooden Indians’ back to the end of the post.